Rotary Swing Tour (RST) Certification is reserved for the very brightest and knowledgeable instructors in the world. 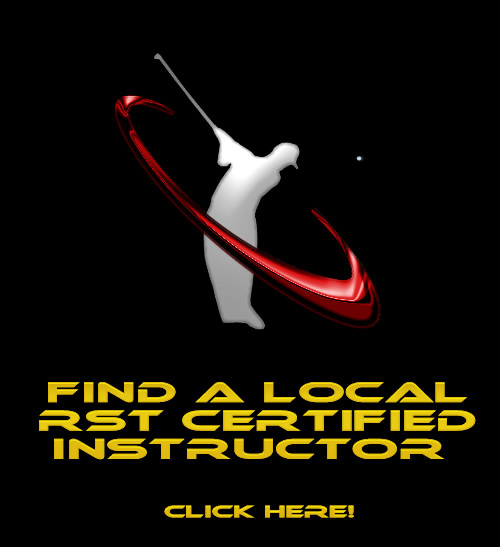 When students take lessons from RST Certified golf instructors, they are guaranteed to be working with the most extensively trained and tested golf instructors anywhere. To become RST Certified is not easy. The tests are very hard and require a deep understanding of many disciplines typical golf instructor training neglects. It is required that all potential candidates progress through each level, starting with the Level 1 certification. Once Level 1 is passed, you will have attained knowledge and understanding about the golf swing that will far surpass anything available to anyone else in the golf instruction industry and will be well on your way to becoming one of the select few "Master Rotary Swing Instructors." I'm tired of teaching "what" to do without fully comprehending the "why" and the "how"
Below you will find a high-level summary of each certification level; details and sign-up information can be accessed by clicking on the title of the level. The first certification level is primarily focused on increasing the instructor's knowledge base so he or she can teach the fundamentals of the safest, most efficient swing based on current research while maximizing students' practice time and effecting real change. The information that must be learned just to pass Level 1 requires on average 100 hours of study on swing mechanics, physics, anatomy, biomechanics, physiology and more. Level 2 Certification builds upon the foundation of Level 1 while adding significantly more detail of the mechanics and biomechanics of the swing. A strong base knowledge from Level 1 is required in order to truly understand many of the complex topics covered in Level 2. Significant time is devoted to the cause and effect relationships of different movements, setup issues and tendencies in the golf swing that the instructor will face on the lesson tee. To become Level 2 certified, not only will you have to fully understand the mechanics of the golf swing, but you'll have to demonstrate it in person with an RST Trainer. You will be required to give four 1 hour golf lessons to a participant while the RST Trainer observes. A pass/fail grade is given for this part of the exam. At this level, you are expected to be an expert at giving lessons in person, so passing Level 2 is done completely in person. You will need to provide the students for your lessons and they are to be performed at our Ritz-Carlton Orlando golf academy location. Additional Requirements: You must be an active, listed (in good standing) level 1 RST Instructor for a minimum of (2) years or more to qualify for level 2 testing, as mentioned in the above paragraph. Becoming a Master RST Instructor is the pinnacle of golf instruction. Not only will you fully understand the biological processes that occur during the learning process, you will have a masterful understanding of anatomy, biomechanics, injury causation, cause and effect of ball flight and swing mechanics and have to demonstrate it working with an RST Trainer over 3 days in person. An extensive online exam requiring you to study video and screen captures of different golf swings will thoroughly test your understanding of the golf swing and ensure you can work with all golfers from beginners to the elite. Additional Requirements: You must be an active, listed (in good standing) level 2 RST Instructor for a minimum of (5) years or more to qualify for Master Instructor Certification, as mentioned in the above paragraph. The Rotary Swing Tour system is a product of years of continuous learning and improvement. All RST Certified instructors are expected to continue their pursuit of excellence in golf instruction, always furthering their knowledge and abilities. Click the link to learn more about the monthly and annual requirements and fees.